Most modern training methodologies are either in live instruction form, virtual web based LMS or delivered in shorts bursts of audio & video content. 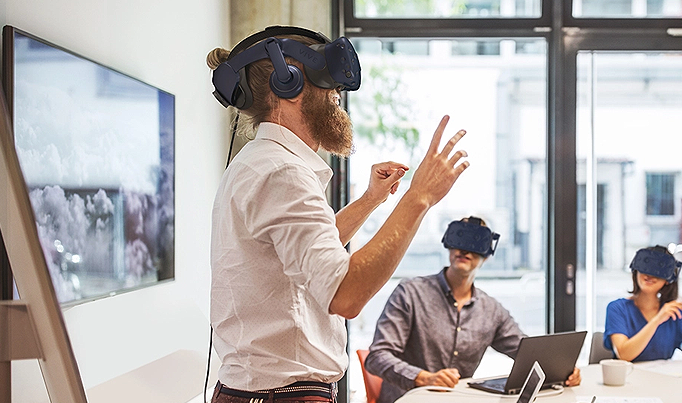 Virtual and augmented reality (or mixed reality) combine all of the above to offer an unprecedented level of flexibility and training effectiveness. Cost effective, fully modular and scalable, virtual and augmented reality training. Regular application updates as well as free hardware upgrades guarantees your business stays on the forefront of digital innovation. Our technology allows for unprecedented ease of access, analytics and integration capabilities to your existing LMS infrastructure. Give users the ability to engage in a natural and meaningful way through incredibly realistic environments & scenarios. Track user and usage data directly from the mobile or web platforms. Track user interaction in real time. Explore metrics after each session or explore high level data from within the application. Allow for users to connect in real-time from their office or home. With real time engagement and interaction functionality. Enhanced analytics powered by tracking user heartbeat, voice tonality and EEG readings. Evaluate and measure training efficiency to ensure training programs are meeting compliance and regulatory needs. As a full turn-key solution provider we fully support your organization with the latest in cutting edge hardware that has been fully configured, tested & calibrated to run your unique virtual training applications. This and our computer free headsets allows for unprecedented scalability & reduced hardware footprint. To meet healthcare facility standards our headsets provide 6DOF. 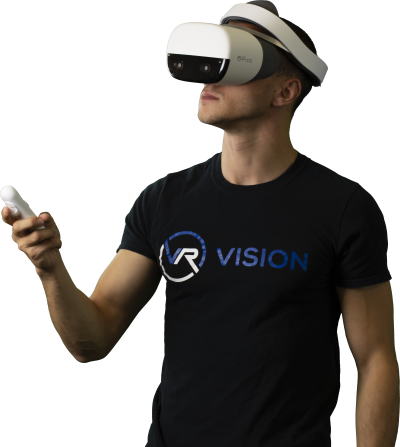 User movement is tracked and displayed in VR from all directions. The technology we use guarantees maximum comfort by providing state of the art weight distribution and keeping weight at under 360g. The HMD’s we utilize, are completely wireless with battery power that lasts up to three hours. There is also no need for PC connectivity greatly reducing the burden on IT. Our core technology is extremely flexible. This allows for in-depth customization of content. 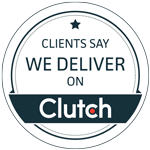 Our specialists will work with you to create the most realistic simulations needed. From our talented 3D Graphics Engineers that create immersive 3D worlds to our state of the art 3D 360 Filming & Capture production team who will capture your facilities and products in incredible detail. Suited for equipment or training on equipment usage or complex mechanical processes. Best for employee training with a focus on soft skills and interpersonal communication. Technology assisted immersive training can be deployed through different systems and hardware depending on your organizational needs and training types. VR headsets create fully immersive 3D environments. Mobile devices to digitally enhance the real world. Immersive web & mobile applications for increased user access. Simulate or recreate any real world safety scenario for zero-harm immersive learning. From basic hazard identification all the way to complex emergency response plans. Transform & standardize employee training by re-creating a multitude of client facing scenarios. Increase empathy, reinforce positive behavior & help delight clients. Easy scaleable employee orientation in a controlled & safe virtual environment. Accelerate employee ramp up time and reduce organizational risk. Your business is diverse and so is what you can achieve with immersive technologies. Deploying our platform and hardware creates an opportunity to bridge silos and increase access to emerging technologies among multiple business units. Enter your name/email and we will get in touch with you to discuss how your business can benefit from immersive training.